You are here: Home › News › ¡Olé! “You feel the music in your heart, and that’s where you learn to dance.” – Ballroom Dancing The Iberian Spanish Dancers offer their audiences something unique and, frankly, hot — a welcome word in the land of nine-month winters. Since their start in 1958, the group has featured Hispanic dance from countries such as Portugal, Chile and Mexico. Puerto Rican dance has a strong African influence, which is somewhat limiting for a few members who are “a little too old to do some of the moves,” claimed Brian Dettmering, a member since 1989. Not to worry, this isn’t a reprise of Cocoon. 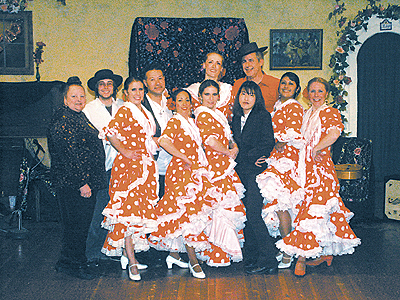 The group’s main focus is on flamenco, an extremely old form of dance that was associated with the gypsies in Spain. Other favorites include the rhumba, fandandos and sevillanas, because they tend to be more upbeat and easier to dance. Membership is free — “you just need to show an interest,” said Dettmering. “We give people our rehearsal schedule and see if they show up.” Be warned, however, “You need stamina,” stated Dettmering. “This is not a teaching group — you learn by watching and hanging in there.” Nevertheless, the 10-strong dance group includes some members that get further training in the craft by attending workshops and classes. Their newest member has been in the group about a year, and two members have been with the group for more than 20 years. The Iberian Spanish Dancers are planning a performance on May 7 at Club Timbuktu, 520 E. Center St. For more information, or if you “feel the music in your heart,” contact Virginia Topitzes at (414) 383-9598. Or visit their website: iberiandancers.org.